Wrote about saving babies and writing werewolves in the new Nocturne authors blog. Still sick, system is really wonky. I'm back. It was a very intense trip, 12 hour days, and grinding poverty. These little girls living in the mountains of Matagalpa, Nicaragua, are just a few children we met. The baby we met in this shack weighed only 5 pounds, and he is six months old. We were with a doctor, and drove the baby and his mom to the hospital ER, a 50 minute drive. He needed immediate medical care or he would die. I'm also very sick now, because of... what? I have no idea. It feels like a conga line of something is dancing with spike heels in my stomach. So I won't be blogging much this week, just trying to get better. Have a good week. Off to Nicaragua, hope everyone has a great week! I'll be in the mountains without internet. Have a good one! 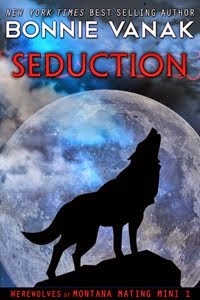 SEDUCING THE VAMPIRE, upcoming FREE book! Here's what's coming up in October from me... a FREE Harlequin online Nocturne serial! This is the title and blurb. It's Indigo's story and promises to be fun to write! Indigo is a Changling, a half vampire, half Draicon werewolf. Yum! Beautiful vampress Avril Antoine is the last person Indigo Mercier expects to stumble into his New Orleans tattoo shop one moonlit October night. Indigo, a half vampire, half Draicon werewolf, took Avril's blood and her innocence more than a century ago, an act that resulted in his banishment from the vampire clan. Now Avril is back in his life, needing a place to hide the legendary Anastasia charm from an evil vampire who covets the amulet's power to fulfill secret hopes and hidden dreams. Avril Antoine remembers the rich, forbidden pleasure of that long-ago night with Indigo. 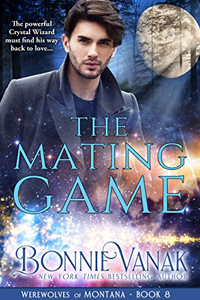 As old passions ignite, it seems he will do anything to seduce Avril back into his bed...and Avril will be forced to choose between loyalty to her clan and surrendering to the dark, sensual call of the forbidden Changling male. Posted today over at The Chatelaines. Dolce, right, is telling Cookie, "Thunderstorms are nothing to be scared of. Just keep bugging Bonnie for treats. Beef jerky always calms me down!" Cookie has decided she likes the bed in the computer room. It will do. Cookie, our new addition, is on the left. Dolce is on the right. He's got a new pal. Typical guy, he ignores her, but likes having her around, lol. Already I can tell she's calmed him down. He longer barricades the door and barks like mad when I leave. He's like, "Uh, ok, buh bye, cyah!" And because I miss her still, and will always miss her, here's a photo from 2006 of my beloved Tia. 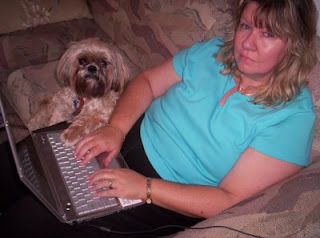 (sniff) She was my "writing buddy." Life is hectic, very busy with personal stuff, and trying to figure out my writing schedule before I leave for a Nicaragua trip in one week. Gulp. October: IMMORTAL WOLF, Nocturne. This is Raphael's story from ENEMY LOVER.